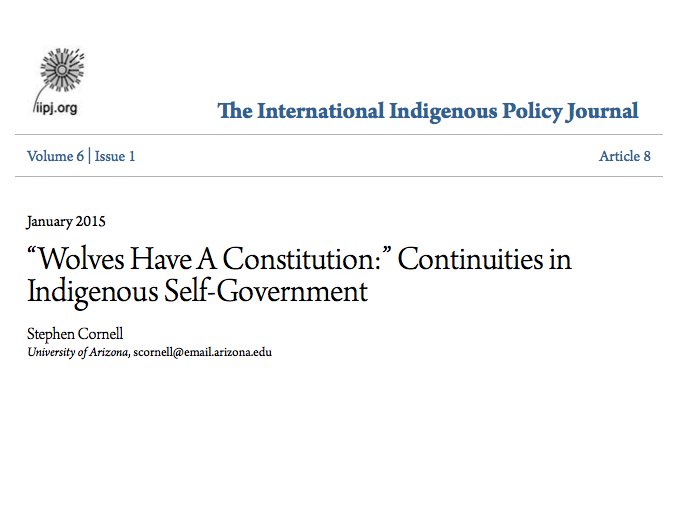 This article is about constitutionalism as an Indigenous tradition. The political idea of constitutionalism is the idea that the process of governing is itself governed by a set of foundational laws or rules. There is ample evidence that Indigenous nations in North America–and in Australia and New Zealand as well–were in this sense constitutionalists. Customary law, cultural norms, and shared protocols provided well understood guidelines for key aspects of governance by shaping both personal and collective action, the behavior of leaders, decision-making, dispute resolution, and relationships with the human, material, and spirit worlds. Today, many of these nations have governing systems imposed by outsiders. As they move to change these systems, they also are reclaiming their own constitutional traditions.